23 May 2014. Engineers at University of Michigan, Massachusetts Institute of Technology, and glass manufacturer Guardian Industries developed a process for producing graphene that overcomes many of the obstacles preventing industrial-scale production of this material. The findings of a research team led by MIT’s John Hart and Guardian’s Vijayen Veerasamy appear online today in the journal Scientific Reports. 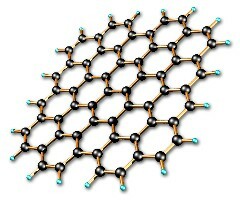 Graphene is a material closely related to graphite like that used in pencils, but consists of only a single atomic layer of carbon atoms arrayed in a hexagonal mesh pattern. The material is very light, strong, chemically stable, and can conduct both heat and electricity, with applications in fields such as electronics, energy, and health care. Despite graphene’s promise, producing the material in industrial quantities remains a challenge. Lab techniques for growing graphene make it possible to produce small quantities of the material, and industrial processes like chemical vapor deposition can produce graphene on metal foils. The problem has been transferring the graphene deposits from the foil to the desired substrate, such as silicon in semiconductors or glass used in solar cells. The MIT-Michigan-Guardian team designed a process that harnesses the industrial scale of chemical vapor deposition, but results in a smooth graphene layer on a substrate of silicon dioxide, a glass-like material found in quartz. Their technique grows graphene on two sides of a nickel film with chemical vapor deposition, which is then placed on a layer of silicon dioxide. One graphene layer binds to the silicon dioxide surface, and the nickel film is then peeled away with an adhesive tape leaving an intact graphene layer on the silicon dioxide. The process removes the up-to-now tricky step of transferring graphene to the desired substrate in production-scale quantities. The researchers report being able with this process of covering 90 percent or more of centimeter-scale target surfaces with graphene, with the only limit being the size of the chemical vapor deposition chamber. University of Michigan and Guardian Industries filed a joint patent application for the process.